Most Samsung smartphones have the ability to run virtual reality apps. All you have to do to enjoy this innovative technology is download the apps and slide your phone into a VR headset. There are a lot of different headsets on the market that promise an immersive, realistic experience. We’ve sorted through all of these to find the 11 best VR headsets for Samsung phones. In this article, you can find out which headset will work the best with your budget, Samsung phone type, and entertainment desires. Before we get started on the more in-depth reviews, we are going to provide a quick comparison of the five best VR headsets for Samsung smartphones on the market. Here’s the basic information you should know about them. Though not compatible with all Samsung phones, the Victony works well with newer Samsung models. Its padded visor ensures a comfortable and secure fit. 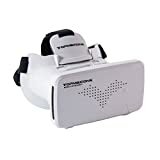 It is primarily controlled with buttons on the visor, so it is a great option for people who want to view video instead of playing games for hours. You can adjust the pupil distance and focal distance, at a 55mm – 75mm range. Moreover, if you have less than 600 degree myopia, you can safely and comfortable use these goggles. Just remember that you cannot adjust the focus for each eye independently. Users with myopia and astigmatism may experience some difficulties with this headset, but people with normal eyesight will love all the features of the Sidaroe VR glasses. They come with a simple controller, and have a media control shutter and a selfie shutter. The secure strap design makes it easy to wear for hours. With this headset, you can experience 360-degree videos and photos, look at 3D movies, and immerse yourself in different VR games. The headset comes with a user manual and cleaning cloth, and it has a 45-day money back guarantee. These VR glasses have a simple design, and are extremely lightweight. They are also very affordable, so they are a perfect option for beginners. This headset comes with features like adjustable pupil distance, which makes it suitable for a wide variety of people. For people who are worried their phone might fall out of their VR glasses, the Topmaxions headset includes suction cups that keep your phone in place. If you have an Android phone between 4 and 6 inches, this is the perfect headset for you. One of the cheapest and best VR headsets for Samsung phones, the Google Cardboard is ideal for people who just want to quickly experiment with VR without spending a lot of money. It is compatible with Bluetooth controllers. Made entirely out of cardboard, you can use the headset to view basic VR on any type of Samsung phone. The simple design makes it ideal for new users. Installing the Google Cardboard only takes three steps. Then, the high-quality, custom-designed lenses do their work, providing you with immersive visuals and experiences. The body of the headset is partially laminated, for the cardboard to last longer. The retro, colorful design really makes the Merge stand out, and the foam interior makes it very easy to clean. There are two buttons on the headset for controls, and this headset is also compatible with handheld Bluetooth controllers. 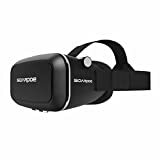 Available in many colors, tech experts recommend it as one of the best VR headset options for kids. This headset has won a variety of awards, such as the Taste Awards 2017 Honoree and the Academic’s Choice Award. Moreover, CNN has called it the best VR headset for tweens and big kids. 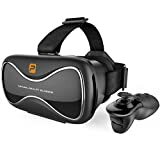 The next entry on our list of best VR headsets for Samsung smartphones, the Destek VR headset offers a 103-degree field of view. It focuses on clarity and immersion, to offer spectacular VR experiences. You can use it to watch 360-degree videos and play games. The lenses are HD and come with an anti-blue light filter that protects your eyes. The headset also comes with a Bluetooth controller that is excellent for gameplay. You can adjust the glasses easily and wear them comfortably for long periods of time. This Mattel-designed mobile VR headset is like a tricked out version of the Google Cardboard. The Viewmaster might be lacking in head straps and controllers, but the viewer portion really stands out. Focal adjustments, a headphone jack, and an ergonometric grip make it comfortable, easy to use, and ideal for children. The latch is easy to open and close, which makes it easy for you to place your phone in and just start using the glasses. The 360-degree experience that this headset offers is just qualitative enough to convince beginners of the value of a VR headset. Though it is one of the priciest options on the market, the many extra features of the Tobias VR headset make it a great choice. It includes built-in, retractable earphones, and an extensive array of controls for adjusting volume, gaming, and even pausing VR to answer your phone. It is completely adjustable, and you can also charge your phone while using the headset. You can adjust the object distance and focus pupil to fit your needs, which means even people with less than 400 degree myopia can use these glasses safely and comfortably, without having to also wear their glasses. The lightweight, innovative design of the Pasonomi VR headset makes it comfortable to wear for hours. An adjustable focal and pupil distance ensures that users can adjust the device to work with their vision. 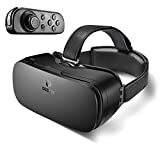 It is a solid choice for entry level users who want to start gaming in VR. The Pasonomi is compatible with many types of handheld controllers, so you can game easily while wearing the headset. The headset has a wide compatibility with Android devices between 4.5 and 6 inches. Due to its ergonomic design and specially designed belt, the headset is concentrated on your forehead, working to reduce pressure to your eyes. This affordable gadget provides a lot of useful features. A three-strap design makes it secure and comfortable, and ventilation holes prevent the phone from overheating. The only downside is that you have to control it with buttons on the headset, and it can get tiring to raise your arm repeatedly. Any Samsung phone between 3.5 and 5.5 inches will work with it, and both VR experts and newbies find it enjoyable to use. The headset comes with adjustable focal distance and pupil distance. Moreover, the lenses are HD and anti-blue light, which means they won’t make your eyes hurt while using the headset for a long period of time. Designed just for Samsung Galaxy phones by Samsung, the Gear has everything you need for playing VR games. Users love the comfortable, lightweight design. It includes a wide field of view and precision head movement tracking. The included touch pad and sensor make it easy to play games and control your phone. Since it is powered by Oculus, you have access to hundreds of games and movies. This is the best VR headset for Samsung due to its wide compatibility, incredible features, and specs. However, you should keep in mind that this headset is a bit more expensive than most. That said, you get what you pay for, so it’s worth the investment. 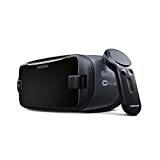 There are a lot of VR headsets for Samsung smartphones available, depending on what you want from your virtual reality experience. All the choices make it easy to find a great VR headset for your Samsung phone. Have you tried out any of these best VR headsets for Samsung yet? Let us know which one you like best!